Are you Looking for an easy to make Christmas table arrangement for your wedding? If so, read on, this centerpiece is elegant, looks like a million bucks and is so easy to create that your guests will surely be impressed. Follow my step-by-step guide and together we will make your unique Christmas centerpiece. Purchase a sleigh or any container from a craft store or use any wrapped decorative box. Hot glue gun green, dry florist's foam to the bottom of a sleigh. 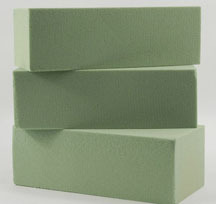 The foam is about $4.00 for 3 blocks. Purchase Christmas pics from any craft store. 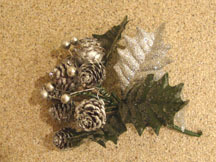 I especially like to add pine cones, red velvet ribbons, poinsettias with red and silver miniature balls. The size of the container that you are using will determine the number of pics that you will need to make your centerpiece look full and impressive. Push the pics into the green foam one pic at a time. Make certain that the color is even and you don't have too much red in one place and too many pine cones next to each other. Use any pattern that you find appealing. As an added touch, you can add a candle to the center of your centerpiece. A note of caution, make sure you purchase a non drip candle, as you don't want your centerpiece covered with melted wax. The cost to make this centerpiece was $7.24. The sleigh container was purchased at a craft store at an after Christmas sale for $3.99. The pics were also purchased on sale and totaled $3.00. 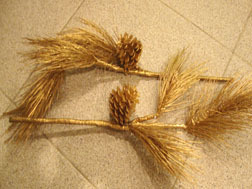 The pine cones were found on the ground and I hot glued them to a stick, no cost. The silk poinsettias were bought at a garage sale for 25 cents and the ribbon was in my ribbon draw, no cost. If you prefer fresh flowers you can substitute the pics with fresh flowers, just be certain to purchase wet floral foam bricks so you can keep your flowers wet and fresh looking. Another Easy Christmas Centerpiece for you to try. As I mentioned above, take a nicely decorated box and fill it with confetti, or any filler. 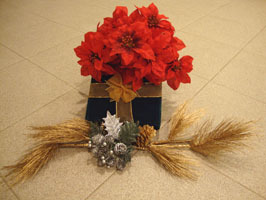 Place the top of the box in front of the box and fill the box with poinsettias. Then place decorated branches and position them in front of the box and set a pic in the center of the decorated branches. I purchased the box and filler at a dollar store for $2.00. The silk poinsettias were bought at a craft store for $4.00. I found the pine cone branches on the ground and spray painted them for 50 cents. The silver pic was purchased at a garage sale for 5 cents. 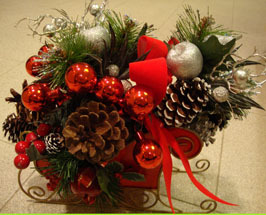 There you go – this beautiful Christmas centerpiece for a whopping $6.55. It was so reasonably priced and easy to create that you'll start making them and giving them as house gifts. These centerpieces will also make fabulous wedding table decorations. Try making an easy Christmas centerpiece and send me a picture of your creation along with instructions on how you put the centerpiece together and I'll be happy to post it for you. My brides will surely appreciate seeing your masterpieces. Need more bridal tips? Visit my introductory page.